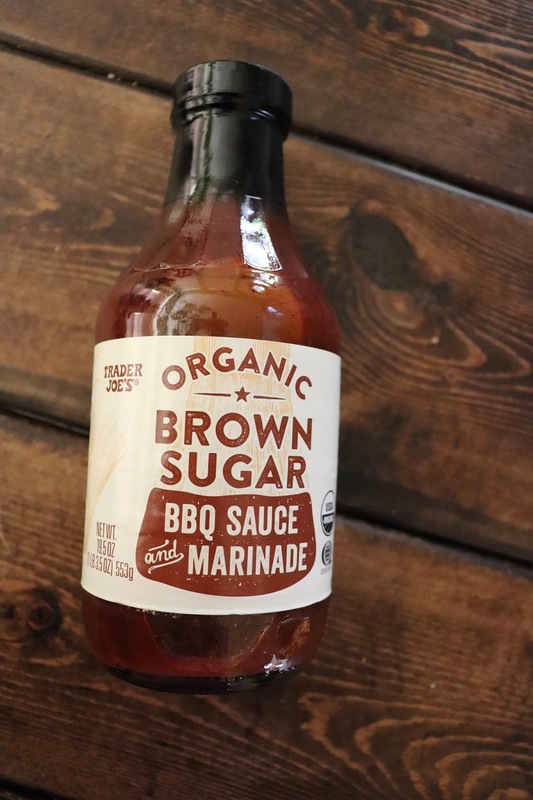 This is my third installment of Trader Joe's Favorites because I just keep finding more and more things we love! This is one of my very favorite quick meals - I brown a pound of ground beef, put in the taco seasoning. Cook the Chimichuri rice and cut white corn and mix them with the taco meat. Top with some avocado (or their reduced guilt guacamole) and you're done! The rice is pretty spicy, but the flavor is awesome! Their sweet potato fries are a staple in our house (I believe I've mentioned them before) and they make a perfect side to their bratwurst. 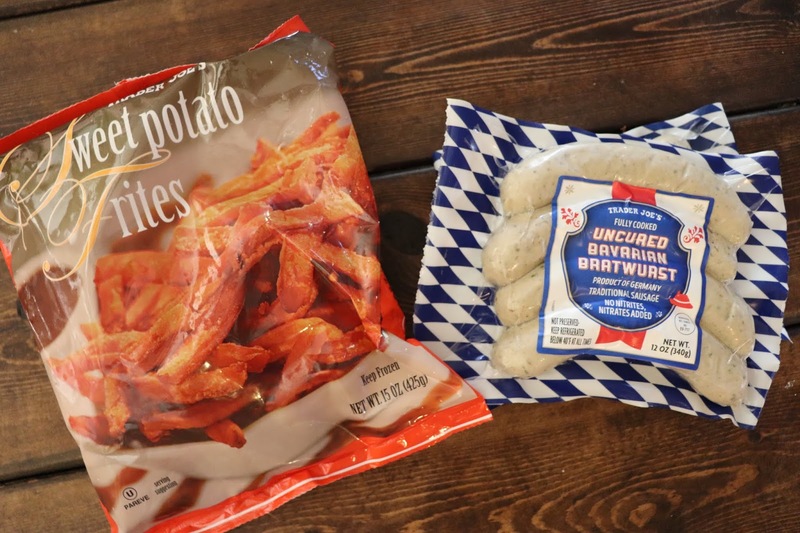 Dave and I love bratwurst in the summer and for whatever reason thought our kids would be opposed (the color isn't my favorite - hahaha), but they were sampling it there one day and all three kids love it so this is a quick and easy summer meal in our house. We grill the bratwurst and are good to go! The next set of items was another thing they were sampling (see a theme here?!?!) and it sounds weird but it is SO GOOD!!! 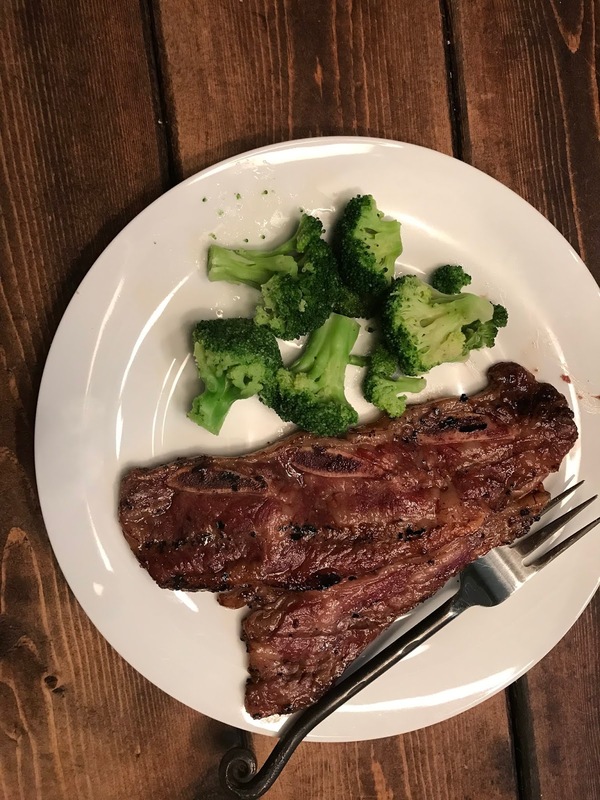 Their beef brisket takes 2-3 mins in the microwave and it is DELISH! 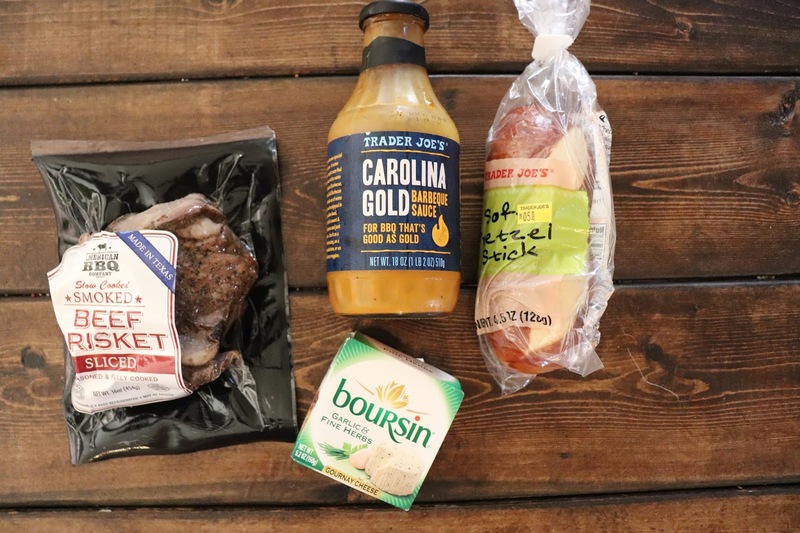 You slice up a pretzel roll, spread some garlic and herb boursin on the bread, top each piece with a piece of brisket and then spread on some of the Carolina Gold barbecue sauce. It's AMAZING!!! 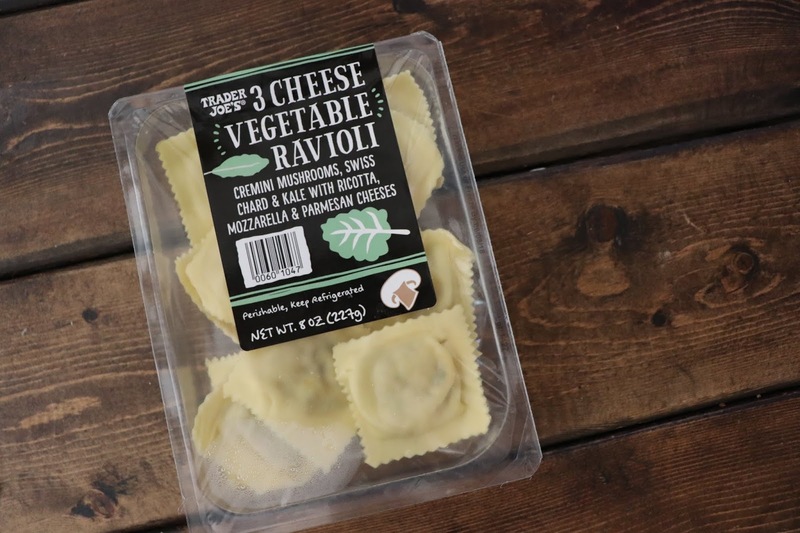 These 3-cheese vegetable ravioli are WAY yummier than you might think. My kids like them with marinara and I like them with a little parmesan cheese sprinkled on top. I've always been a Sweet Baby Rays die-hard fan but THIS may change my ways. So so so good on grilled chicken! 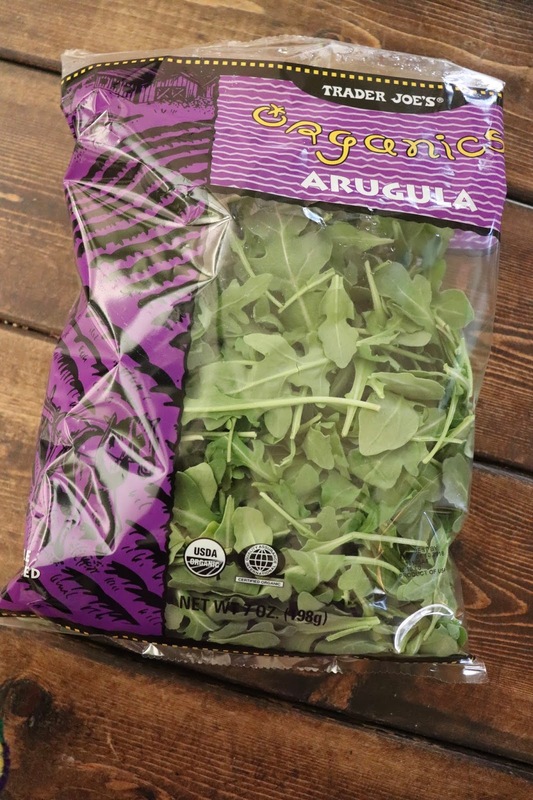 Random, but I love arugula on burgers and theirs is always a great price. I've always turned my nose up at non-homemade mashed potatoes... but that was until these frozen garlic mashed potatoes snuck into my life. They're little frozen cubes and you can pick as few or as many as you want and then heat them on the stove or in the microwave. They're tasty and awesome for a night I need a side in a pinch or when Dave comes home from work late and needs something more hearty than the grilled cheese and strawberries I fed the kids :) And these sweet Italian chicken sausage are grilled perfection! The traditional carnitas mixed with fire roasted peppers and onions with some shredded cheddar in a tortilla - YUM! The Persian cucumbers and mixed medley cherry tomatoes (with the garlic and herb boursin) has been on major lunch. The cucumbers are extra crunchy and these are my absolute favorite kind of tomatoes. We've done "Pizza Friday" in our house for years and the kids current favorite kind of pizza is homemade. Their dough is a great deal and the sauce is my favorite. I feel like the picture speaks for itself... ah.maz.ing. My kids all love hash browns and it's a great breakfast with a fried egg. They come out crispy and delicious and they ask for them pretty much every morning. If they're not asking for hashbrowns they're asking for french toast made with the cinnamon swirl bread. I don't put any cinnamon in the egg mixture but do put a little bit of vanilla instead. Last but not least, an instagram friend told me I needed to try this and OH MY WORD!!! If you love peonies you need to try this hand soap! I've probably made it to Trader Joe's about four times total since they opened, but this post makes me think I need to head there ASAP! Thanks for all the Trader Joe's tips. It's my favorite place to shop and find new products. I like all your meal ideas. My mom told me that she went to Trader Joe's just this weekend because of YOU!! Just this last weekend I sampled the Jicama Mango Slaw. Sooooo good! It comes with jicama and mango all pre-sliced and some cilantro thrown in. There is a dressing that you pour over the top. It says there are three servings per container, but I ate the entire thing myself on Monday morning! I love the fire roasted peppers that you showed in your post. They are so easy to pour in a pan with potatoes and chicken sausage. Great hearty breakfast and so easy when I was doing a Whole30. We also like Chomps meat sticks. Easy snack for all of us. We try to eat "Whole 30" as much as we can, at least at home, and all of these ideas sound really good. Thanks for the ideas! Going to Trader Joe's tomorrow! I've been hearing about the cauliflower gnocchi and am excited to try that too! I looked for the brisket and cinnamon swirl bread this past Saturday and couldn't find either. I was excited to try them both. Oh no!!! Are you local? I am going today. Our closest one is in Tallahassee. I love the tomato soup with croutons and cheese! Also the salami and pepperonis are the best! YES!!!! Agree to all of this! So glad I will be close to a TJs this weekend. I’m going to have to stock up. Thanks for all of the great suggestions! You're so welcome! Have fun! I don't have a TJ's close by! Such a bummer. I may need to make a trip to the closest one soon though to try out some of these things. I LOVE Trader Joe's Chai Latte Mix! It's so good! I also love their cookie butter- I'll snack on it with graham crackers or sometimes pretzel sticks. Yum!! I know everyone raves about their cookie butter but I just couldn't get on board!! OK so I have to ask, I bought a few boxes of the hashbrowns and the directions say you have to pan fry or oven bake them. I swear you said you put in toaster? Am I crazy?? Plus I have to say, while I am a HUGE MOMFESSIONALS fan and just love you all, your trader joe posts are my favorite. I never know what to go when I go there and I may or may not have popped on your blog, searched trader joes and made a list. Love you for that. 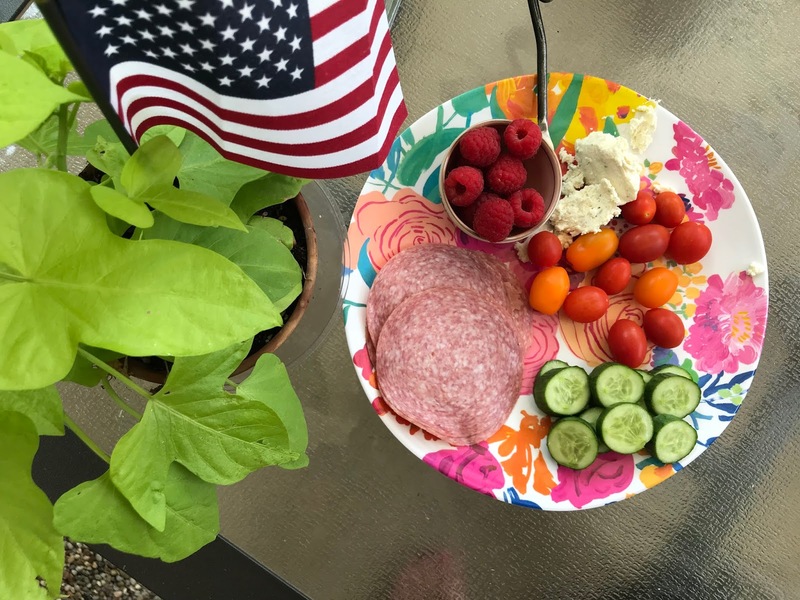 Thanks from a sweaty mom in Arizona looking for some quick and easy things to make for dinner some nights! I don't put them in the toaster - I think someone commented that one time but I couldn't figure out how it wouldn't destroy your toaster with grease. I bake mine in the oven :) And I'm so glad that you like the recommendations! Oh my - I now have to go there during lunch!! honest to goodness, Trader Joe's has the BEST tater tots. I know, so random ... but they are so good. also faves: this ____ walks into a bar (pumpkin is seasonal, but delicious), the applewood uncured bacon (OMG level yum), and the new to us chocolate covered virginia peanuts. I wish TJ's wasn't an hour away. sigh. We love their hash browns so I believe you!!! Their (frozen) french onion soup is excellent! Going to have to try the carnitas and the fire roasted veggies. I love to use the fire roasted veggies on our flat bread pizzas. And yes that peonies soap is awesome! as is the rose water toner water! Yes! It's not frozen - so make sure you look for it in the fresh meat section. If you haven’t tried it yet.. their tabbouleh (Not the cauliflower one) and roasted garlic hummus are so delicious on the mini pitas. Ooooh! Trying both of those! Thanks! I have TJ envy. The closest one to me is 2 1/2 hours away. I want all the things. Oh girl. You know I love their flowers!!! Oh goodness...we go there all the time and I don't think I've ever purchased any of those! I really want to try to ravioli! Our closest two TJs are 4 hours so I make carefully planned visits a few times a year! LOL. You have to try their bath and body products! They nail all of them. Right now I’m loving the rose water toner, hair mask (amazing), and tea tree facial pads. I just bought the lavender dryer bags and am in love. We hoard all different kinds of their hand soaps. For food-all the meat and cheeses are on point for a charcuterie board! Different sausages are great for pizza, on rolls, with sauces. The k-cups for coffe and their tea is great as well! Recently had the chicken fried rice and it was so good. We’ve never had a single thing we don’t like! Love that you put together meal ideas from Trader Joe's as the 3rd installment of this type of post.